Update: Pet Airways is back. Although Pet Airways stopped operating in 2013, they are now back as a chartered flight service. That means they no longer operate as a pet transport company, but you can charter a flight and you and your pet can travel together. According to news sources, they ran into financial trouble and let a lot of pet owners down. In February of 2012, The New York Times reported that the airline was having financial difficulty, as well as problems with a change in the contractor supplying planes. This led to flight cancellations and left pawsengers stranded and very unhappy. Their website is no longer functional and has been reduced to a parked place holder, and there hasn't been a post on their Facebook page in a long time. Pet Airways is an airline dedicated to (what else?) transporting pets. Need to send your cat across the country? Your cat will travel in style and comfort, complete with cabin accommodations, a pet attendant, and carefully scheduled potty breaks. I decided to write this page about PA after having a conversation with a pet owner, and an employee of a local pet store. As I write this, PA is relatively new and I have not spoken to anyone who has personal experience with their service. Still, I realized during my conversation with these two people at that store, that some pet owners may not know about this service, and even pet industry workers may not. So, here we are. Here's my story: I was in the local PetSmart store the other day, and I met a woman who said she was moving to another state. We're on the east coast of the US, and she was moving to a west coast state, about as far away as you can get and still stay in the United States. She was talking to one of the PetSmart employees about her upcoming long trip, and she had two dogs with her. She was worried about traveling with her dogs by plane. She said that they would ride below, and her cats would be in the cabin with her. She was very concerned, especially about one of her dogs who was obviously extremely skittish. Immediately I thought of Pet Airways, although at the time, I couldn't be sure if I was correctly remembering the name of the airline. I asked her if she'd checked into the "airline for pets," to see if they could transport all of her pets in the cabin. She gave me that blank stare that has become familiar to me. I see it when I've made the mistake of thinking that I'm reminding someone of what I think they already know, when in fact, they have no idea what I'm talking about. Not everyone spends every waking moment looking into resources for pet owners. Unsure that I had guessed the name right, and now completely unsure that I even knew what I was talking about, I was finally able to coax my Palm Centro to give up the URL. Feeling a bit vindicated, I gave the woman the URL of the site, and suggested she check it out. I explained that I had no idea whether or not they would fly to the cities she needed, but I thought that maybe it was worth looking into. According to their website (update: now a parked domain) Pet Airways will transport your cat in a pet carrier via one of their specially converted turbo-prop planes. 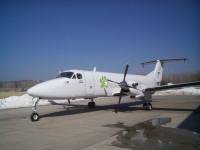 They use Beech 1900 aircraft which have been set up with a proprietary restraint system which holds the pet carriers in place. 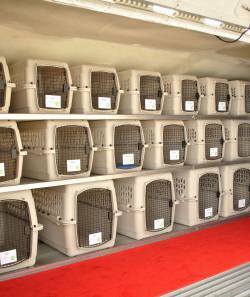 The pets (pawsengers, or more specifically, catengers) travel in the main cabin, not in cargo. The pet attendants coordinate potty breaks and check on the animals every 15 minutes during flight. As I'm sure you know, the travel industry is huge. Companies that provide pet travel stand to do substantial business if they do it right. This includes moving pets for breeders, owners who are moving, temporarily moving, or even just vacationing. It's not too surprising then, that in July, 2009, Pet Airways came under fire just as it was launching its inaugural flight. Concerns about PA not being a member of IPATA, safety issues, and the newness of the company were mentioned. Do you think there's a need for a service like this? Will another company surface and fill that need? Or is it a bad investment?